Jacks is proud to carry Homelite ignition parts. 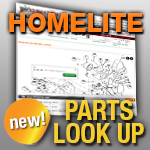 When you have a small engine repair that requires Homelite Replacement Parts, we are your best bet online. For parts for your ignition system, including Ignition Modules, think Jacks.